Popular Malayalam author and English poet Kamala Das is celebrated with a Google Doodle today. The artist of Kamala Das' Google Doodle is Manjit Thapp. Google Doodle of famous Malayalam author and poet Kamala Das. 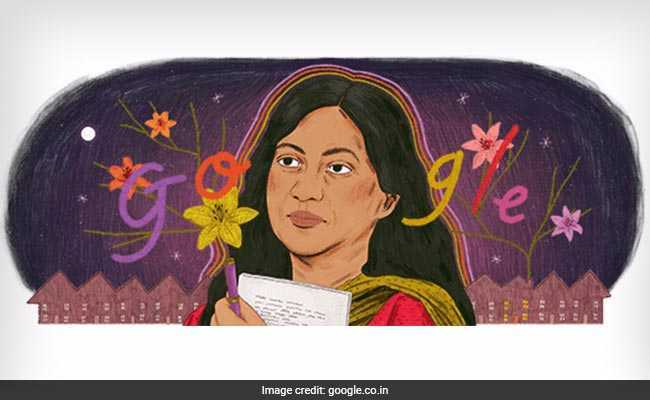 New Delhi: Google honours poet and author Kamala Das with a doodle on the publication date of her autobiography, "My Story," that was released in 1976. Kamala Das' life and work had a boldness and shape-shifting quality, whether it was the many genres she wrote in or the various languages in which she expressed herself. She was determined to live life on her own terms, resisting labels such as "feminist" and choosing different names for herself over the course of her life," Google wrote in a post. The artist of Kamala Das' Google Doodle is Manjit Thapp, which Google said, "provides a window into the world of an engrossing woman." Kamala Das was born on March 31, 1934 in Kerala's Thrissur district. Her father, VM Nair, was the managing editor of the widely circulated Malayalam daily Mathrubhumi and her mother Nalapat Balamani Amma was a Malayalam poet. Like her mother, she excelled in writing and her love of poetry began at an early age. She was noted for her many Malayalam short stories as well as poems written in English. "I speak three languages, write in two, dream in one," she was quoted as saying. Kamala, also known by her name Madhavikutty, married at the age of 15 to Madhav Das who encouraged her writing interests. She wrote on diverse topics ranging from women's issues, child care and politics. Her first English poetry book "Summer in Calcutta" was well received. Her famous works include: Pakshiyude Manam, Neypayasam, Thanuppu, and Chandana Marangal. She also wrote a novel called Neermathalam Pootha Kalam, which was critically acclaimed. At 42, Kamala Das wrote her autobiography in English, which was later translated into Malayalam. "The story captures her life from childhood to marriage and beyond, describing the rich inner world of a creative soul," said a Google post as it celebrated her literary works with a Google Doodle today. For her literary works, she was awarded Honorary D.Litt by University of Calicut and Muttathu Varkey Award in 2006. At personal front, the couple had three children M D Nalapat, Chinnen Das and Jayasurya Da. Kamala Das later also adopted two blind Muslim children, Irshad Ahmed and Imtiaz Ahmed, who, she said, brought her closer to Islam. At 65, Kamala Das embraced Islam and assumed the name Kamala Surayya. She died at the age of 75 on May 31, 2009 at a hospital in Pune and was buried at the Palayam Jama Masjid at Thiruvananthapuram. Her last book titled "The Kept Woman and Other Stories", featuring translation of her short stories, was published posthumously.